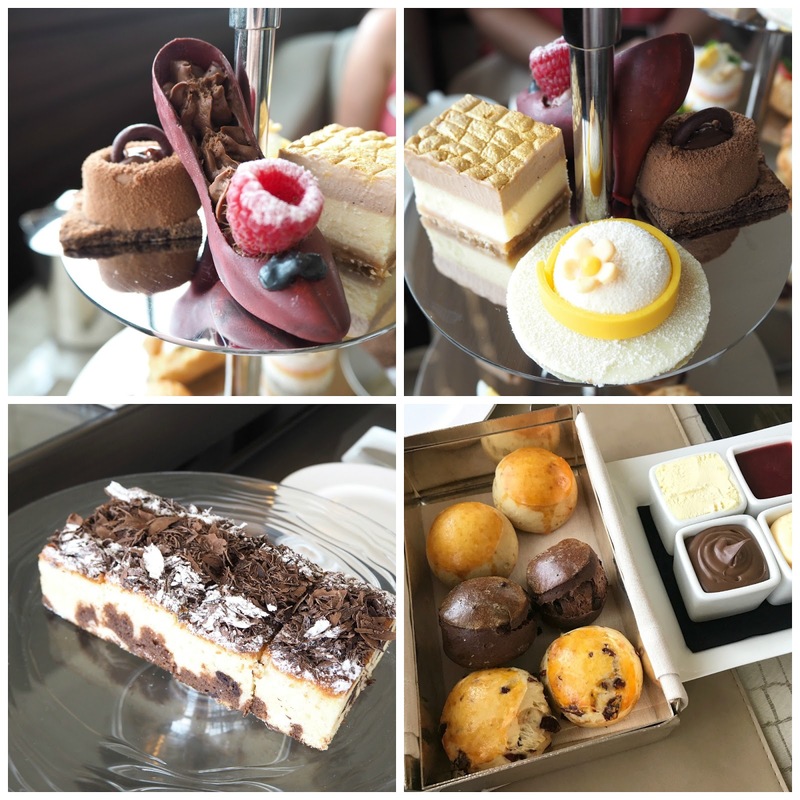 I've tried a lot of afternoon teas and my favourite ones are always those where the food is immaculately and creatively presented-and, of course, you'd expect an afternoon tea at Armani Hotel to tick both of those boxes-which it absolutely did! Each month, Armani Hotel presents a themed afternoon tea which is served in the light and airy Armani Lounge which is housed inside the worlds tallest building-the Burj Khalifa. The lounge is spacious with huge comfy chairs and the window seats have incredible views of the Dubai fountains. Armani hotel is hands down the best place to watch the fountains-all of the restaurants have amazing panoramic, uninterrupted views. Octobers theme is fashion and the amazing pastries on the stand all had an exquisite creation linked to the theme-the perfect combination of high fashion and fine dining. 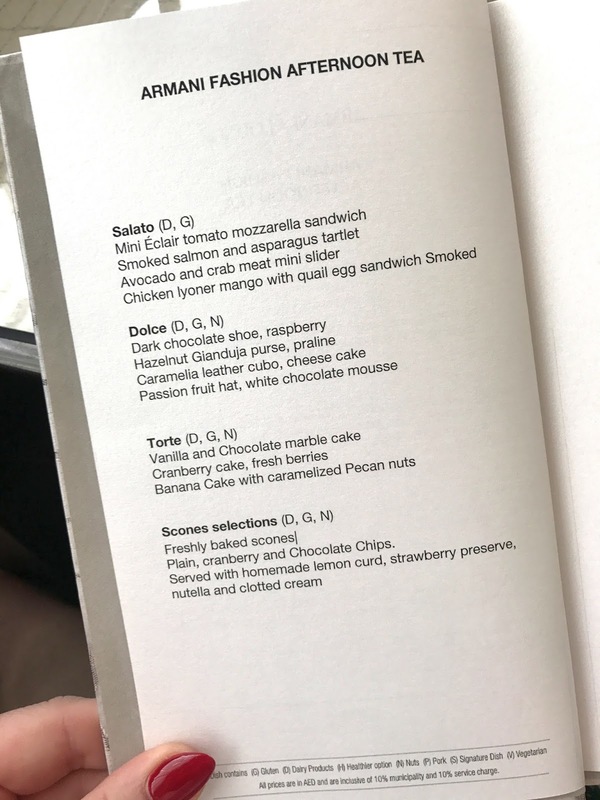 The divine signature cheesecake had a golden 'mock-croc' topping, there was a passion fruit-filled white chocolate sun hat, a praline ganache 'handbag' and the highlight-a dark chocolate mousse filled chocolate stiletto. Each item was perfectly formed and utterly delicious. I was also a big fan of the vanilla and chocolate marble cake and the petite but beautifully presented 'sandwiches'. The scones were light and moist and I loved the addition of Nutella and lemon curd alongside the more traditional jam and clotted cream. Nutella on a scone is definitely my new thing! The food was plentiful and the tea is excellent value for money. The service is warm, friendly and flawless whilst also being discreet and unobtrusive. We were offered top ups to our tea and were fortunate enough to meet Fabien the head pastry chef who gave us a sneak peek into some of the upcoming themed teas. It's safe to say I will definitely be back! 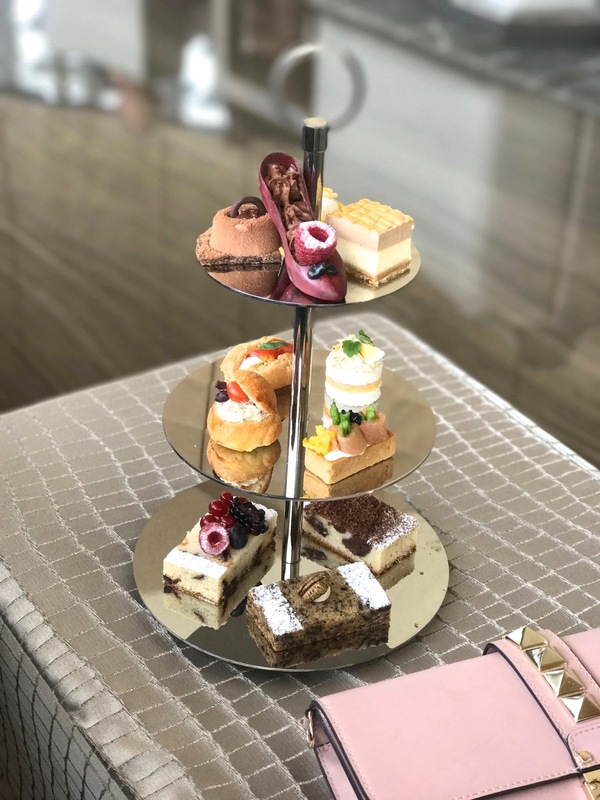 Armani Lounge is the perfect place to enjoy a sophisticated yet relaxed afternoon tea with beautiful food, impeccable service and beautiful views. Armani is one of my favourite hotels in Dubai, you can read my thoughts on their amazing Indian restaurant Amal here, and my review of their wonderful spa here. The Armani afternoon tea costs AED170 per person or AED300 per couple and is available every day. I think it's my new favourite!